£100 non-refundable deposit is required to secure the booking, Balance payable 4 weeks prior to arrival. Caravan is available to hire starting any day of the week for any duration (minimum 2 nights). which is situated on an established pitch, complete with palm tree's! If you want to watch the little ones play on the extensive green to the front whilst enjoying the front deck area accessible from the lounge, you can. Or if you prefer to sit and enjoy the views of the countryside, the gated side decking area will ensure the little ones or your furry friend cannot wander off, allowing you some time to relax. No need to wash dirty beach wear in the on site laundry as we have installed a washing machine for your convenience. 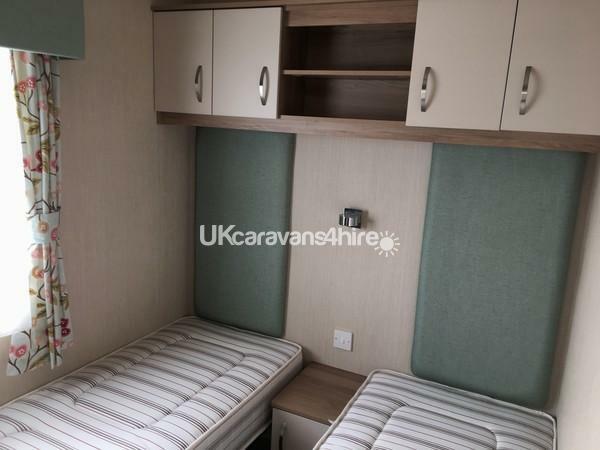 The opulent living area is the heart of the caravan, you can relax on the deep-filled sofas whilst watching TV/or playing a DVD and enjoy the Company of your loved ones! The spacious kitchen is equipped with all the modern day appliances including oven and grill, full size fridge freezer and microwave. 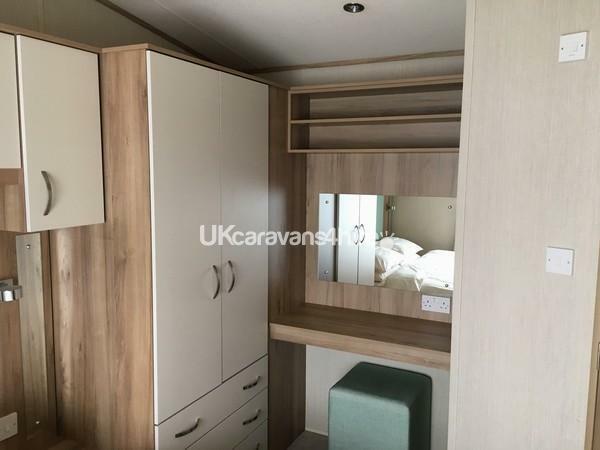 The master bedroom complete with en-suite WC is finished to a superb standard and includes a fitted wardrobe, overhead storage, mirrored dressing area and stool, bedside tables, bedside lighting and TV. The twin bedroom comprises of twin beds, built in furniture and plenty of storage space. A contemporary designed family bathroom with all the amenities makes this feel like a home from home. We look forward to welcoming you to our caravan and are sure that you will have a great stay! 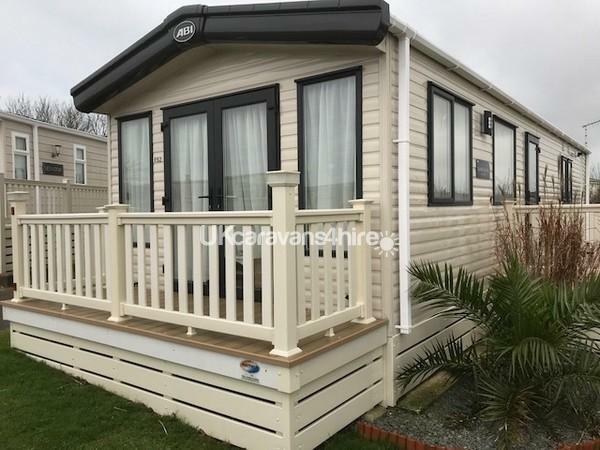 Had an excellent stay in this caravan, condition of the van is very new, the location on the site is perfect, lovely views all round and very generous space around the caravan, two decking areas, one to the side and the other at the front which patio doors open on to. 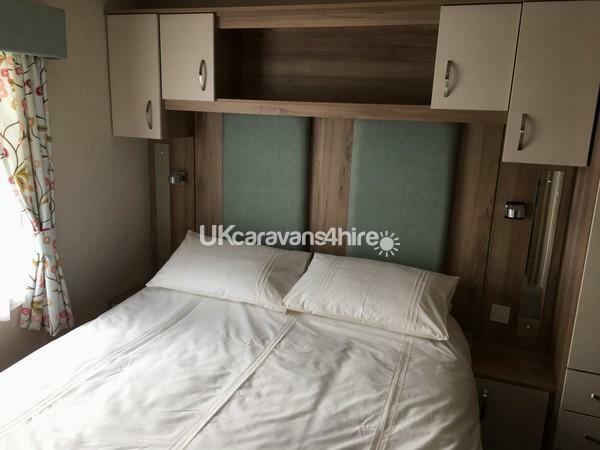 The cleanliness of the van was spotless, it is well equipped, the bed and furniture are all very comfortable, and a huge TV, made for a very nice stay. There really is nothing to fault. Would definitely be booking again with the owner. Thanks. Booked the day before, what a find! 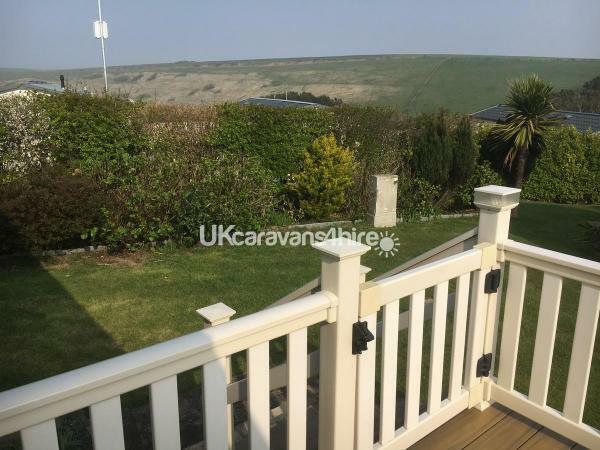 Sacha replied straight away to my queries and within 24 hours we were enjoying the luxury the caravan had to offer in a superb location. The caravan had all you need for self catering, was exceptionally clean and we had a wonderful couple of days here. Walking distance to Durdle Door and Lulworth Cove but also local to many more lovely places. We crammed our days and it felt like we'd been away for a week. Highly recommended.